This afternoon Sarah and I drove to Huntington, West Virginia to go to Camden Park. It is the smallest amusement park we have ever been to. The park is just a two-hour drive from home, yet this was our first visit. We arrived at five o'clock to take advantage of the Starlight admission. Since the park closed today at ten, this gave us five hours to hit all of the rides. We also had time to sit down at the West Virginia Grille for a good meal. 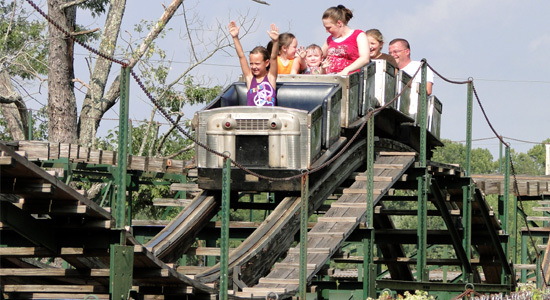 Many of the rides in the park were traditional rides that you would find at most amusement parks, like Paratrooper, Dodgem', a train and a log flume. One unique ride was the Haunted House. It was like many dark rides with a maze of track through a series of scenes. But the cars were not motorized like the other dark rides. This ride begins with a chain lift like a roller coaster and the twisting track through the rest of the ride is gravity powered. Another unique aspect of the ride is the breaks at the end of the ride. One of the ride operators stands directly in front of the car as it exits the darkness and physically stops it with all his strength. I would have never guessed they would have a human brake like that. I saw one kid come off the ride crying. Not from the scenes inside, but from the guy appearing out of nowhere to stop the car. One side of the park around Big Dipper was surrounded with a tight collection of rides, concessions, games and asphalt. It wasn't the cleanest or greenest park I've been to. At the same time the other end of the park had a pond with swan paddle boats surrounded with rides, trees, grass, the log flume and the train ride. This area was the park's saving grace. Of course the main attaction for us was the park's two roller coasters. 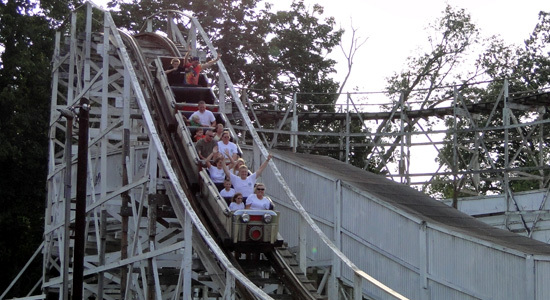 The first coaster we rode was Little Dipper. This family coaster had a metal structure and wood track. The unique train cars have one row each. The other coaster in the park was Big Dipper. The reputation of this classic coaster precedes itself. The coaster has a simple layout and nostalgic trains. Sarah and I enjoyed our evening at Camden Park. We both have now ridden every roller coaster in the entire state of West Virginia. All two of them. 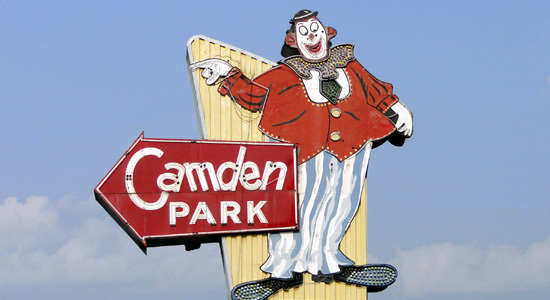 Click here to see all of my photos of Camden Park.